Referring to the Dhola-Sadiya bridge, PM Modi said, "This is one of the most important infrastructure projects in our nation." Prime Minister Narendra Modi, on the occasion of third anniversary of BJP government inaugurated India's longest bridge in Assam. Bhupen Hazarika who passed away in November 2011 was a legendary Assamese folk singer who made a mark in the Indian film industry too. Many of his songs delved on humanity and brotherhood. He was awarded the Padma Bhushan for his achievements 2001. He had also received the Padmashri in 1997. He had also received the Dadasaheb Phalke Award, India's highest award in cinema, in 1992. 12:15 pm: This bridge will provide 24/7 connectivity in the region where people were earlier dependent on ferries. 12:10 pm: North East is known for its Ginger, If farmers here grow organic Ginger, it can be marketed across the world. 12:00 pm: PM Narendra Modi begins speech in Assam on the completion of three years of his government and the inauguration of India's longest bridge. The 9.15-km long bridge will reduce the travel time between Assam and Arunachal Pradesh from six hours to just one hour as the distance will shrink by 165 km. It will serve 2,20,000 people in the region covered. 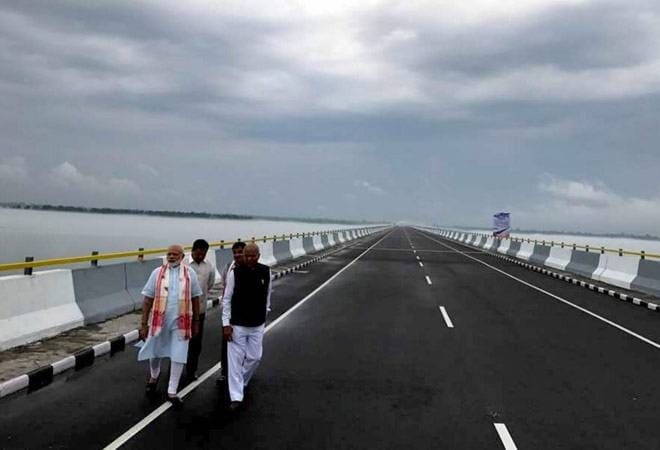 The three-lane, 9.15 kilometre Dhola-Sadiya bridge has been built over river Lohit, a tributary of the Brahmaputra, and links Dhola in Assam to Sadiya in Arunachal Pradesh. The bridge is 3.55 kilometres longer than the Bandra-Worli Sea Link in Mumbai. In Assam, the bridge is located in Sadia, 540 kilometres from Guwahati. Its other end is in Dhola, 300 kilometres from Itanagar, the capital of Arunachal. The bridge will facilitate movement of Indian forces and can withstand the weight of 60-tonne battle tanks. Steel Authortiy of India has supplied around 90 per cent, or around 30,000 tonnes of steel, including TMT, structurals and plates, for the bridge. Its construction started in 2011. The approximate cost of the project is said to be around Rs 10 billion. It falls under the aegis of the Ministry of Road Transport and Highways in public private partnership (PPP) with Navayuga Engineering Company Ltd.
PM Modi took charge on May 26, 2014, after leading the Bharatiya Janata Party's (BJP) to a stunning victory in Lok Sabha elections. Law and Justice, Information Technology Minister of India Ravi Shankar Prasad tweeted: Innovations in Digital Payments have made India the only country in the world with a finger print based payment system. Chhattisgarh Chief Minister Dr Raman Singh thanked the Prime Minister for Pradhan Mantri Awaas Yojana, a housing policy for all, on three years of Modi government. In his tweet, he said 10 lakh houses would be constructed under PMAY in Chhattisgarh by 2018.